I wanted to make some patriotic cards for today to thank all our service men stationed all over the world...I also want to thank all those that have serviced in the past. Our country is what it is today because of the brave men that have served our country and I feel so blessed to live in this free country. 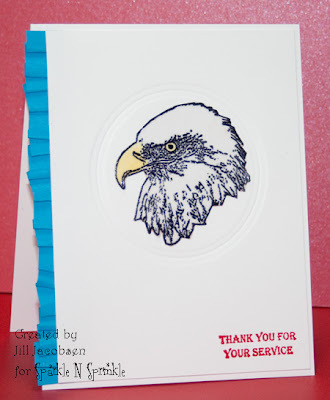 For the first card I decided to make a clean and simple card using my Patriotic Icons stamp set. I wanted to use the Eagle, so stamped him on Vellum with Versamark and embossed with Black Detail and colored his beak and eye on the backside of the vellum, cut it out then using a glue stick glued him to the embossed circle. Then I embossed the sentiment with Red Apple Embossing Powder. I needed a splash of blue, so I put the ruffle on the side, then used dimensional tape to put the panel on a white card base. For my second card I had a piece of the double embossed background (I will be sharing a video on this technique in the next week so keep watching) laying on my desk and cut it into little panels. Then I embossed the Statue of Liberty with Turquoise Nugget Embossing Powder and cut it out and adhered it with dimensional tape. 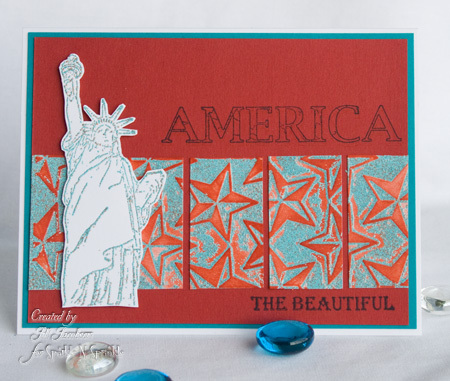 The sentiment is from the Patriotic Backgrounds set and was just stamped with blue ink. And if you are interested in the stamp sets they are on sale this week!! I hope you have a blessed Memorial Day!